In order to treat the dry skin, it is necessary to understand potential causes of the problem. Several factors may contribute to the dryness, but the problem will not be completely eliminated without treating the specific problem. Varying degrees of quill loss may also be associated with dry skin. 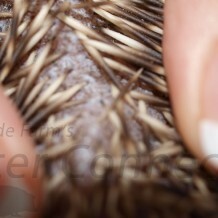 Quill loss and dry skin may indicate a mite infestation or fungal infection but is not always the case. A veterinarian can rule out mites by observing skin scrapings under a microscope and performing a simple fungal test. It is very important to visit the vet and ascertain the reason for the dry skin if the problem persists or there is quill loss. Our Quilling Article has more details on this subject. Your vet will need to do a skin scrapping and will prescribe antibiotic if necessary. Fungal spores are airborne and can be transferred easily throughout the environment. Fungus (dermatophytoses. (Vet Med, 1999). Hardwood beddings and dusty beddings can also dry the skin. Certain dietary issues may also cause dry skin. Winter is the most popular time for dry skin. Just like us, your hedgehog’s skin will get dry in the winter. Adding some moisture to the air with a humidifier will help. Humidifiers must be cleaned regularly, because they can harbor bacteria, which may cause a respiratory infection in your hedgehog. Some hedgehogs are simply prone to naturally dry skin. Good skin care will generally help dry skin not related to other sources of dryness.